Weekender is an amazing psychedelic shoegazey dreampop band out of Philadelphia. Earlier this year they released a five song ep titled Spanish Peaks which was available as a 'name your own price' download. The ep was just picked up by the smart folks at PaperCup Music and Spanish Peaks was re-released this week. If you love sweet melodies with reverbby vocals and swirling guitars (more psychedelic than shoegaze, but fans of either genre will dig it) you'll get sucked in on the very first song and swoon through all five tracks. 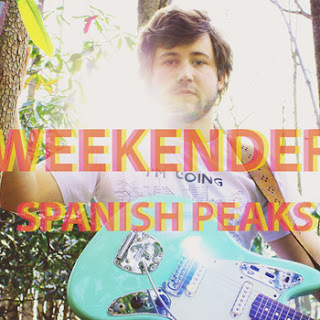 Do yourself a favor and check out Spanish Peaks - the title track is streaming below and the full ep is available to download from iTunes and Amazon. Catch up with Weekender on Facebook and Twitter.